In 590 AD, Pope Gregory I unveiled a list of the Seven Deadly Sins – lust, gluttony, greed, sloth, wrath, envy and pride – as a way to keep the flock from straying into the thorny fields of ungodliness. These days though, for all but the most devout, Pope Gregory’s list seems less like a means to moral behavior than a description of cable TV programming. So instead, let’s look to one of the saints of the 20th Century — Mahatma Gandhi. On October 22, 1925, Gandhi published a list he called the Seven Social Sins in his weekly newspaper Young India. A great man for all spiritual (and religious) and religious doctrines. A man for all to emulate. 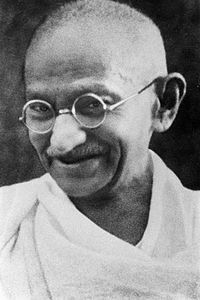 This entry was posted on February 15, 2015 by Vox Populi in Opinion Leaders and tagged activism, Gandhi, Opinion Leaders, peace activists, Politics without principles, Seven Social Sins, Social Justice.